Portuguese superstar Cristiano Ronaldo is reported to have reached a verbal agreement to sign a new long-term contract with Real Madrid. The 32-year-old has struggled in front of goal in the Spanish La Liga this term, and this had spread speculation that the current season could be his final one with Los Blancos. However, according to ABC, the European champions have sorted out terms over a new deal with the Ballon d'Or winner, and an announcement could be made in the near future. The proposed extension is likely to involved an £8m on his current £18.5m wages which would put him on par with Neymar's wages at Paris Saint-Germain. Real Madrid are pretty much out of the race for the Spanish La Liga this season, and their chances of further silverware lie primarily on their Champions League campaign, where they are eyeing a hat-trick of titles. 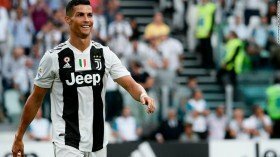 Ronaldo turned his form around during the knock-out phase of the elite competition last term, and the club will hope that he finds his peak form later this month, where they face Paris Saint-Germain in a round of 16 tie.